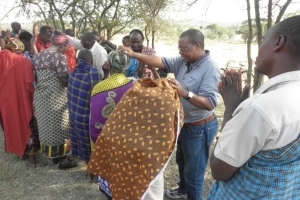 It was the first time, Bible stories were played at six different areas in Tanzania. The exercise was very successful, tremendous and an exciting event. Everything was done as planned. We were welcomed blissfully at all places we went. We met the different denominations gathered together and eagerly waiting the Bible stories recoded in their mother tongue language. It was a powerful message and many people who came to listen were thrilled and touched in a different way. People loved GRN Ministry because it's true stories that can make them understand the Bible clearly. We managed to reach 6 different areas as planned - at Manyara we visited three areas and 3 in Singida as well. At Dirma in Manyara the participants were 57. The Choir sung and there were celebrations all over the place. In Minghenyi there were 10 people and Ghehandu there were 70 people who participated. 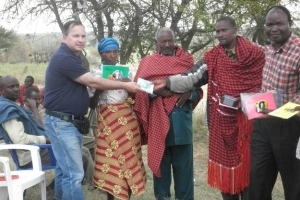 Almost 137 listened the cds in Manyara and appreciated and ready to work with GRN Ministry. Kinampanda in Singida, we had two services, the first sessions were 97 participants, and the second sessions were more than 100 participants. 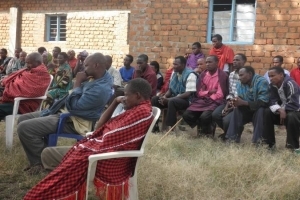 In Ulemo 170 people with different denominations gathered together and listened the Nyiramba CD. At Iguguno more than 100 people met to listen to the Bible stories. We only shared the Good news from the CD. There were 8 books that have not been shared or introduced. 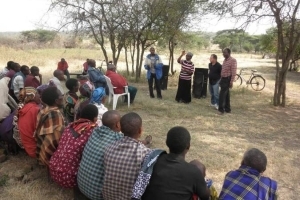 About 604 people listened the Bible stories both in Manyara and Singida. The Tools we received from heard office were not working and special the Nyiramba cds. Alternatively we used laptop and managed to play the nyiramba cds. Where are the tools so that we can start the work of reaching out to targeted people? We should left the equipments at the hands of the Pastors so that they will use to reach individual family, small groups and make sure they complete all Bible stories in a chronological approach and ask them the questions as we did previously and bring to a repot each month. GRN Kenya, need to know that the equipments is very important and there is an urgent need to be supplied at all the areas we visited. However, The current need for the locale will be to have at least 10 Saber each church to help the meet the need and reach out to many at a go.